I don’t know what I was thinking the day I made these. My goodness, they were time consuming! But man-o-man, they are gooood!!! They are the best eaten cold. Keep them in the fridge. Combine peanut butter and powdered sugar with electric mixer until creamy. Fill a piping bag or plastic zip-top bag with peanut butter mixture (if using zip-top bag, snip a small hole in one corner). Pipe peanut butter mixture into each Bugle until just full. (You won’t be able to use all of the Bugles, because some are duds with flat openings, but that’s okay, you’ll have enough good ones.) 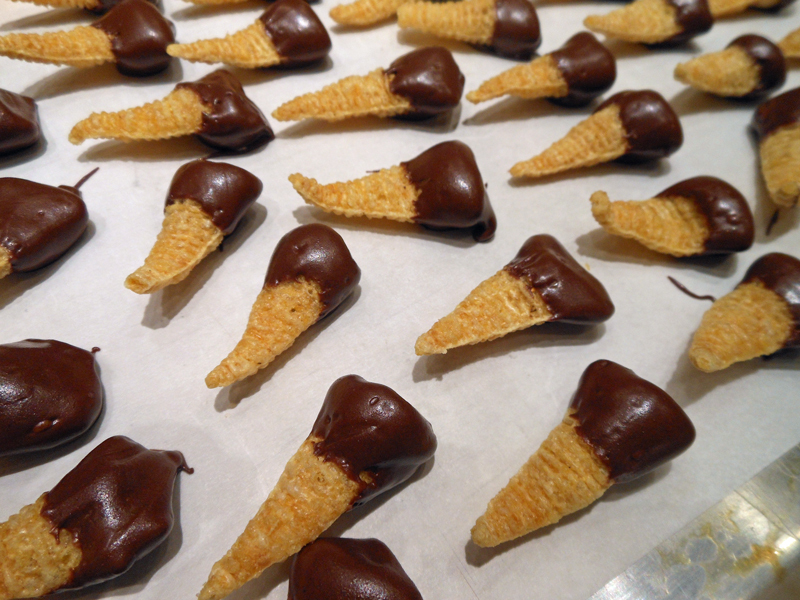 Melt chocolate chips, and dip open ends of stuffed Bugles into chocolate. Set each on aluminum foil or parchment paper for several hours, until chocolate is firm again. Refrigerate.